NSW volunteer organisation Primary Ethics may have a powerful enemy in the Reverend Fred Nile, but it has a world class ally in his holiness the Dalai Lama who this week has thrown his weight behind a campaign for keeping Ethics as an alternative to scripture in NSW schools. Teresa Russell, the CEO of the charity that teaches volunteers to deliver the classes as an alternative to scripture, said she was delighted with the Dalai Lama’s comments, but outraged that the NSW Liberal Government might have struck a deal with the religious right independent the Reverend Fred Nile to get its power privatisation legislation through parliament. Primary Ethics has launched a petition calling on the NSW government to not make any changes to enrolment forms. “When parents want their child to attend a NSW public school, they must complete an enrolment form. Currently on this form parents choose if they want their child to attend scripture classes, ethics classes or “supervised activities” once a week. The law giving children the right to attend ethics classes was passed on Dec 1, 2010. The current enrolment form was introduced in June 2014 to reflect the 2010 change in legislation. “There are at least 100,000 children who currently don’t attend religion classes in NSW primary schools each week. “Christian providers of scripture classes in NSW admit that they are behind plans to draft children into scripture classes without the knowledge of parents or care-givers. They have convinced Premier Mike Baird to change the enrolment form so that the only question asked is, “What is the student’s religion?” This was the question that used to be on the enrolment form before ethics classes were written into law in late 2010. There is no mention of ethics classes and no mention of the fact that you don’t have to go to a religion class in the proposed revised form. For that matter, it doesn’t tell you that by answering that question, you are enrolling your child into a religion class in that faith, if it is available in that school. However Ms Russell met with His Holiness the Dalai Lama earlier this week who then spoke with The Sydney Morning Herald about the importance of teaching secular ethics to children. His Holiness then signed one of Primary Ethics posters, which will feature in 145 JCDecaux Sydney CBD sites over the next week, which were donated to media industry charity UnLtd. 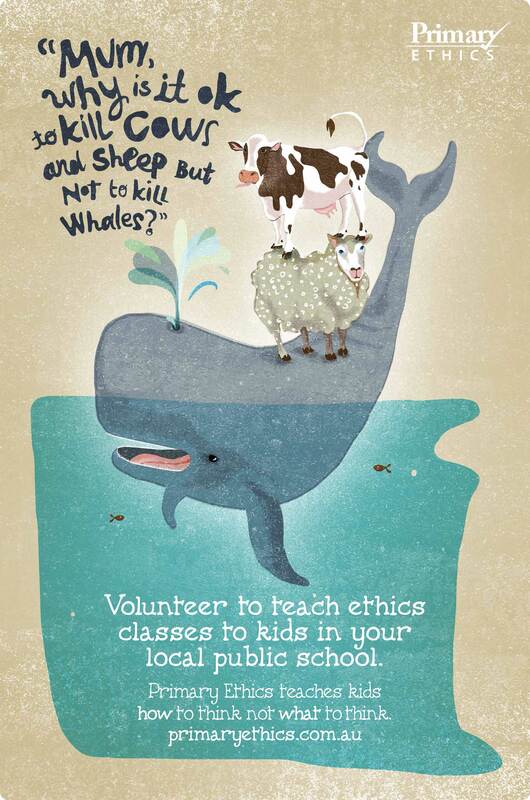 The posters were produced by 303Lowe and are helping Primary Ethics in its quest for volunteers to teach Primary Ethics classes in their local public schools. “Primary Ethics teaches kids how to think, not what to think,” Ms Russell said. To sign the petition to help Primary Ethics click here.